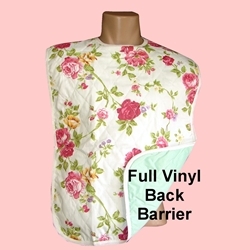 Our Adult Quilted Bib for woman feature a pleasing pattern and has a snap neck closure and a FULL Vinyl waterproof back barrier. Please note we cannot guarantee the pattern of bib you will receive the inventory changes often. Two snaps at the neck to adjust for neck size. PLEASE NOTE: Please note we cannot guarantee the pattern of bib you will receive the inventory changes often.